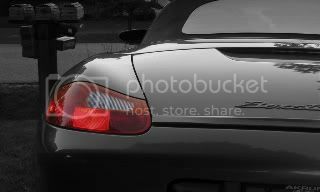 Intro: I am selling my daily driver from the last year, an exceptionally clean 2003 Porsche Boxster S (986) with 91,070 miles. Asking $12,750 OBO. Guards Red over black, six-speed manual transmission, 3.2L 258 HP flat-six engine, VIN is WP0CB29833U661336. Well-equipped, very clean inside and out, with extensive recent maintenance and service records. PCA member, engineer, and multiple Porsche owner, I’m only selling to reduce my vehicle count. Previously owned by another local enthusiast who used it for road trips, favoring his Jeep and motorcycle for winter and around town use. Being a 2003 this is a “986.2” model Boxster with a number of improvements over past models including more HP, a glass rear window, suspension tweaks, and more aggressively styled bumpers that resemble the GT3 Aerokit style. Exterior: Gloss Red, when properly maintained, is a very striking color. With a recent professional polish and two coats of Zaino wax, the red on my Boxster is deep, clear, and glossy, overall in excellent condition. As you would expect there are a few small rock chips on the mirrors and front bumper, but significantly less than on an average 90k mile vehicle. There is a single dent (see photo gallery) on the convertible top tonneau cover that is difficult to see, I had it quoted for PDR but never got around to having it removed. There is also a small area of light crazing at ground level on the front bumper (see photo gallery), very subtle unless you are on your hands and knees. The wheels are the highly desirable Carrera Lightweight 18” that were produced for Porsche by BBS, and were recently professionally refinished by Alloy Wheel Repair. Tires are Firestone Firehawk Indy 500 UHP summer tires, new in 2016 and only used over the summer so the tread level is close to new. The top operates like new and only shows light wear from use, and the glass rear window is clear and free from damage. The optional wind deflector is in place, which makes a noticeable difference on the highway. Further enhancing the look are 7 mm front and 15 mm rear wheel spacers, which give the car a wider stance and eliminate the factory tucked wheel look. Also, the ugly orange side markers have been replaced with OEM Hella clear lenses. Overall it is a very striking car that will get looks and compliments. In 2011 it was involved in a minor front end collision while with the previous owner, he had the repairs completed by Porsche of Wichita using all OEM parts. As you would expect the fit, paint, and quality of repair are like OEM. All receipts from the repair are included. Interior: Again, exceptionally clean. All interior functions work 100% correctly, including the onboard computer, cruise control, power windows and mirrors, heated seats, lighter, wipers, and HVAC. The A/C blows cold even on a 100+ degree KS summer day. The gauges are all clear and do not have any missing pixels. Enhancing the interior are a set of Lloyd Rubbertite custom fit floor mats and the center console professionally painted in Guards Red to match the exterior. The console also features the non-smoker’s kit with storage cubby in place of the ash tray. The typically problematic cupholder has been recently replaced, and the typically broken center console hinge is unbroken. Audio is from a JVC head unit with Bluetooth for streaming and hands-free phone, including an external microphone. Speakers are Memphis Audio woofers in the factory door enclosures and Alpine 2-way coaxial speakers in the dash. The leather is overall in excellent condition and has had multiple treatments with Leatherique, the driver’s seat shows very light bolster wear. There is light wear on some of the plastic trim panels on the door and where the seat belts rest, but again far less than on most similar cars. There is one small nick on the dash that has been repaired (see photo gallery), but it is very subtle and blends in well. The driver’s side sun visor mirror is missing the cover, which can easily be replaced if desired. No smoking, food, or pets. The original owner’s manual is in place, and one keyless entry fob is included and working correctly. Overall it is very clean and well taken care of, far nicer than the average car of this age and mileage. Mechanical: As this car has served as my daily driver and I am a very particular engineer, it has received significant maintenance to insure reliability. Replaced in the last year include the tires, Hawk brake pads and wear sensors in the front, brake and clutch bleed, transmission fluid, GBox 2nd gear detent, rear trailing arms, cleaning between the A/C condensors and radiators, pollen filter, engine air filter, ignition switch, Interstate battery, spark plugs, ignition coils, alternator, serpentine belt, gas cap, gas cap door spring, inside front trunk trim, both window regulators, top tension cable, front oxygen sensors, and multiple oil changes with Mobil 1 0W/40 synthetic. The oil and filter were recently changed in August. I have all records from my ownership as well as the previous owner, records extend back to 2009 and are summarized in Excel. Upgrades from stock include removal of the stock intake snorkel for a little more sound, LN Engineering spin-on oil filter adapter, FVD shifter with Function First metal bushings, height adjustable Porsche weighted shift knob with boot (currently set high for easy shifting), Vivid Racing performance tune (can be returned to stock with included cable), and wheel spacers. As you would expect the driving experience is excellent, with tight steering, straight tracking at highway speeds, strong and vibration free brakes, tight and responsive handling, strong acceleration without any warning lights, and smooth shifting with a strong clutch. Very few cars can combine being this fun, this practical, this reliable and still return 30 MPG on the highway. The lone mechanical issue is the occasional pop out of 2nd gear, in daily driving I probably experience it 2x per month on average. There is dampness at the engine/transmission joint, likely from a weeping rear main seal which is common at this mileage. There is also slight seepage from the transmission selector shaft, again a common issue. I would and have driven this car anywhere, including multiple weekend road trips with my wife. Summary: Long story short, if you are looking for a clean Boxster S to drive and enjoy, they don’t get much better than this. This car has been a dead reliable daily driver for the last year, but I simply have too many cars to maintain and enjoy. I have done my best to describe the car with full disclosure; my desire is to have the car be better than described to any potential buyer. Clean and clear KS title in my name, no liens and ready to sell. Payment will be accepted by cash, wire transfer, or cashier’s check with bank verification. Also included will be the original audio head unit and amplifier and a set of factory repair manual copies in binders. Over 100 high resolution photos and the maintenance file available by email. Thanks for looking! Last edited by onewhippedpuppy; 10-04-2017 at 06:37 PM. If you have to ask.......just kidding! Brain fart, I have updated the ad with my asking price. Beautiful car, good luck with the sale! Would buy this in a heartbeat if it were Spring '18. These are the rules I've established with my wife. Sigh. Beautiful car, man. Would you be able to post some photos of the underside if they are available? thanks! Lucky buyer, congratulations and thanks for the update. Thanks all! It went to a great home, a local Porsche guy who also has a 911SC coupe, M635i, and M3. Even better than the cars are the people that you meet through the cars. Congrats!! Thank you for being so helpful on the phone with me. Super nice guy. I'm sure the buyer got a great car! !